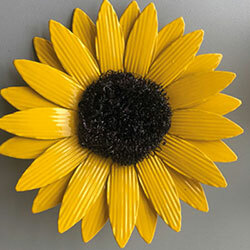 Remember a loved one this summer with our Sunflower Plaque (Option 1). 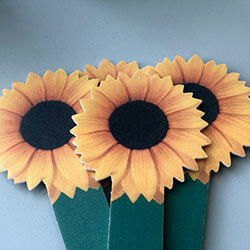 In return for a donation we will write the name of someone special to you on one of our lovely Sunflower Plaques. Your sunflower plaque will be planted in our special Sunflower Planters and be displayed in the Hospice grounds throughout June. On 29th June we will be holding our Sunflower Afternoon Tea between 12 noon and 3pm where you can drop by for a cuppa, view your sunflower in the display and take it home with you when you leave. If you can’t make the event and would like to receive the Sunflower Plaque afterwards then tick the box on the form and we will post it out to you. We invite you to remember your loved one this summer with one of our Limited Edition handcrafted metal sunflowers (Option 2). For a suggested minimum donation of £20 we will plant one of these beautifully realistic metal sunflowers to display in the Hospice grounds throughout June. If you come to the Afternoon Tea on the 29th you can take it away in its presentation box or if you are unable to come we can post it out to you during July (please add a small extra charge of £2.50 per sunflower for p&p). Option 2 - Limited Edition Ironwork Sunflower with certificate and presentation box. Join us this summer to celebrate happy memories by taking part in our Sunflower Memories Appeal. In return for a donation we will write the name of someone special to you on a sunflower plaque. Your sunflower will be planted in our special sunflower planters and be displayed in the Hospice garden throughout June. On Saturday 29th June we will be holding a Sunflower Afternoon Tea between 12 noon and 3pm where you can drop by for a cuppa and a cake, browse our stalls and view your sunflower in the display. To dedicate a Sunflower Plaque complete the online form and then click on the link to make your donation securely through PayPal, or download our Sunflower Memories application form, complete and return to us along with your donation. *Please note that your details will be held on our database and we would like to contact you from time to time to keep you updated on how we spend your valuable donations and other ways you be interested in supporting us. We promise that we never pass on, sell or share your information with any other party and all your details are used only for our financial, statistical and communication purposes. If you would prefer never to receive communications from us then please call us on 0191 512 8436 or email the fundraising office and we will ensure that your communication preferences are updated.